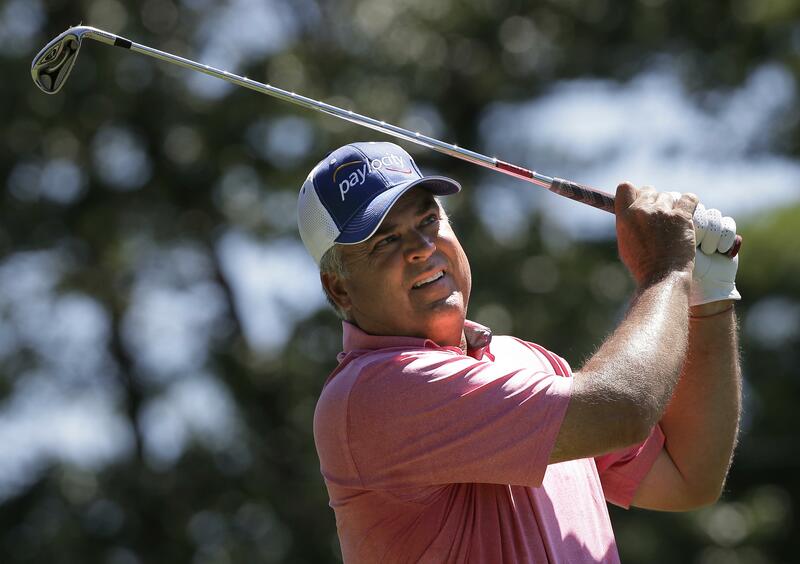 UPDATED: Sat., Aug. 4, 2018, 1:34 p.m.
At TPC Twin Cities, Blaine, Minn.
BLAINE, Minn. – Across the Atlantic Ocean last weekend, Kenny Perry was already looking ahead to this weekend’s 3M Championship. With all his accomplishments at the TPC Twin Cities, who could blame him? Perry shot a 12-under-par 60 Saturday and leads the PGA Tour Champions event by five shots over Glen Day. From 212 yards on No. 18, he missed shooting 59 by inches. “I hit the prettiest 5-iron I could ever hit. When I heard everybody yell really loud I knew it was close,” Perry said. The ball barely scooted by on the right, leaving an 8-foot putt for eagle. His two-round score of 126 is a tournament record. “I’m really blown away by my round today. That’s a confidence builder; it tells me I still can do it and I’m not quite washed up yet,” said Perry. He had shoulder surgery late last year and called this season “erratic” with two top-10 finishes in nine previous events. Perry won this event in 2014 and 2015 and has finished worse than seventh once in seven appearances. Hale Irwin is the only three-time winner of the tournament, in its 26th and final year. The tournament will be replaced by the PGA Tour’s 3M Open next July. Day, who shot a bogey-free 65, said the field is likely playing for second place on Sunday. “I’m going to have to shoot probably better than 65 and he’s going to have an off day. . If he makes some putts and gets off to a good start, I don’t think anybody can catch him,” Day said. Tom Gillis (67), Lee Janzen (68) and Jerry Smith (70) are at 10 under. Smith, who had a two-shot lead after the first round one, opened with nine straight pars before a bogey on No. 10. Tom Lehman shot 66 and is among four players nine shots back. Perry leads the tour in driving distance at just over 300 yards – 24 yards above the tour average – and with wide fairways, Perry need not hold back, leading to shorter irons into greens that received nearly three-quarters of an inch of rain overnight. “I’m hitting it further now than I hit it when I left to have surgery,” Perry said. Perry started with three birdies in five holes before an eagle at the par-5 sixth. He birdied Nos. 12, 13, 16 and 17 on the back nine before the eagle at 18. “When I holed it on 6 today from 106 yards, I thought maybe this would be a special day,” Perry said. Published: Aug. 4, 2018, 12:23 p.m. Updated: Aug. 4, 2018, 1:34 p.m.